Earlier in the year, I featured this establishment on “derryX Dines” before they added a small Sunday brunch menu. You can read all about that trip here. The hype machine has been running and hyping a new brunch menu at Midtown located at 289 New Scottland Avenue in Albany, NY. Being that my previous trip was a success, I was compelled to return for the new brunch. Not surprisingly, the interior of the restaurant has not changed. We were greeted by a waiter, Kevin, who I know from my days of weekly stalking out Aquilonia Comics in Troy on Wednesdays at noon, the time they open on the day comics are expected to arrive. We quickly caught up, and I mentioned I was there to try the new brunch. He gave us brunch menus and let us look it over. Disappointingly, online, there is no information on the brunch, other than the fact that they feature omelets, pancakes, french toast, eggs, breakfast burritos, bagels and much more! The actual menu, on the other hand, was not disappointing in the least. They pretty much have at least one or two varieties of each food. 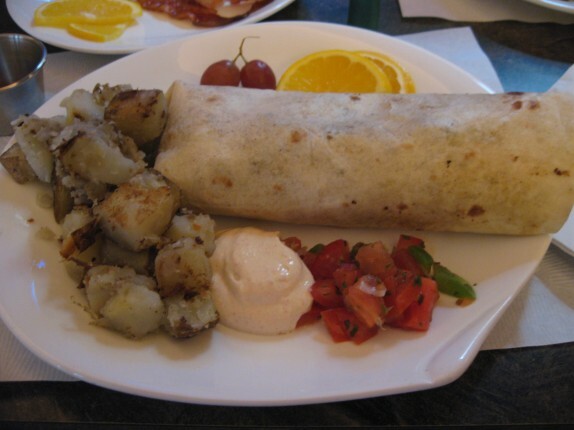 For example, there was a normal breakfast burrito and a chorizo breakfast burrito; there were three different varieties of omelets in addition to a “build your own” option; there were a few other specials and things. I guess until they post the menu online, you’ll have to check it out to see everything. I ordered the Chorizo breakfast burrito, which was said to have 2 scrambled eggs, onions, peppers, hash browns, chorizo, and cheddar cheese wrapped in a flour tortilla and served with hash browns, chipotle sour cream, and salsa fresca. The burrito was very good. It’s not my usual three egg omelet with feta cheese and bacon, but it was good. The eggs were scrambled nicely inside. The chorizo was nice and smoky. I asked for some hot sauce, and my buddy brought me about a tablespoon of sriachi which was perfect to provide a good kick to the whole burrito. So in addition to the every day bagel menu that I reviewed on my first pass, the addition of a Sunday brunch to Midtown’s menu is a great thing for their establishment. Check them out on a Sunday morning soon! Hey have you checked out Excellent Adventures comics up in Ballston Spa? My good buddy owns it and I know Wednesdays, being new books days..you can find lots of treasures. I have been there. It’s part of my circuit of places that I check when my shop can’t get what I need. Cool place.